Applying a team-based subscription model to the Topps Now Baseball platform, 2017 Topps Now Team Reserve Baseball lets collectors automatically receive new MLB card releases for their preferred franchise(s). Going forward, all cards in the 2017 Topps Now Baseball checklist can be obtained in groups of three ($24.99), five ($39.99) or ten ($74.99) consecutive cards from a chosen team. Collectors can also decide how many of each release they want, with as few as one card per issue to as much as 20-card bundles. There are also five-card and ten-card bundles for each new release. Shop for Topps Now Team Reserve cards on Topps. While some collectors would be interested in a service that provides them with all players from a team over a given year, this is much more complicated without knowing the exact breakdown and, therefore, not currently an option from Topps. 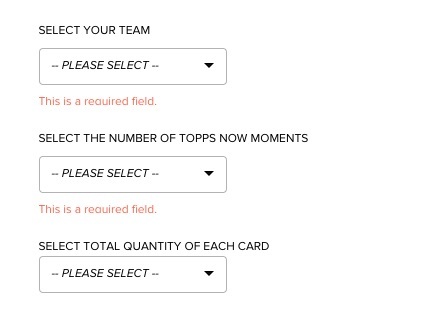 To order, simply visit the Team Reserve page to select your team, number of consecutive Topps Now Moments, and total quantity for every card. It is important to point out that although 2017 Topps Now Team Reserve Baseball includes the base Now cards and multi-player options that feature the team in question, it does not extend to autographs, relics or any limited-edition versions. If a collector has any remaining cards on their order following the end of the 2017 World Series, collectors can receive store credit or a refund for the leftover amount. The 2017 Topps Now Team Reserve Baseball program can be canceled at any time. Check back as more information is provided for 2017 Topps Now Team Reserve Baseball. 2017 TOPPS NOW #134 5 10 17 RYAN GOINS 1 197 WALK-OFF HIT TORONTO BLUE JAY Win!